LUCENA CITY – It was the end of a long political reign for the political family who has been holding this city in the palm of their hands for almost 2 decades with the poll victory of a close political rival from an equally formidable political clan. Ex-city mayor Ramon Talaga Jr., wife Ruby Talaga, and sons Romano and Ramil all lost for various city, provincial and congressional positions they have chosen to run as political candidates in the recent local elections. Mayoralty bet Ramon Talaga Jr. lost to Roderick ‘Dondon’ Alcala with over 20 thousand vote margin – 36,046 for Talaga Jr. as against Alcala’s 50,795 – the first time that Talaga gets such an electoral drubbing in his entire political career while his wife, Ruby lost in the congressional fight by more than 75,000 votes to Roderick’s uncle, incumbent vice governor Vicente ‘Kulit’ Alcala who got 131,178 votes as against Ruby’s 55,519. 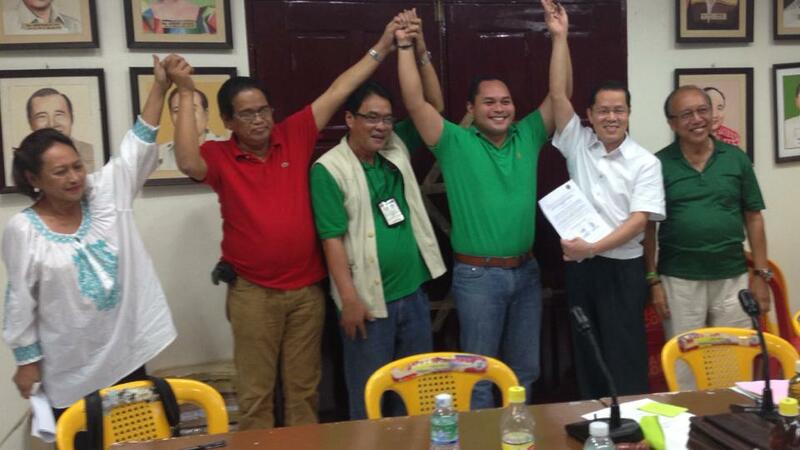 Son Romano lost in the vice gubernatorial race to Sam Nantes, the son of former Quezon Gov. Rafael Nantes. Romano garnered 311,416 votes as against Sam’s 385,900 or 74,484 lead. Ramil who ran as vice mayor to his father Ramon, also lost to ex-vice mayor and Dondon’s runningmate, Philip Castillo with over 4 thousand vote margin. The Talagas ran under the opposition United Nationalist Alliance and National Unification Party (NUP) while the Alcalas ran under the administration Liberal Party. Both the winning mayor Alcala and vice mayor Castillo, who ran under the Liberal party banner, have already been proclaimed by the city board of canvassers led by city election officer Ramir Larita at the city hall annex on Tuesday morning. In the city council race, Anacleto Alcala III, grandson of his namesake, former Quezon Gov. Anacleto Alcala Sr., led his 5 other LP colleagues in making it to victory. The others are Sunshine Abcede, daughter of former human rights lawyer Ed Abcede; reelectionists Dan Zaballero and Boyet Alejandrino, and returning councilors Vic Paulo and Benny Brizuela. Meanwhile, in the provincial vote canvassing, the son of agriculture chief Proceso Alcala, Irvin Alcala succumbed and lost in the gubernatorial fight to incumbent Gov. David ‘Jayjay’ Suarez who garnered 418,895 votes against 358,943 for Alcala or a vote margin of 59,952. For the vice gubernatorial race, Nantes’ only son, Sam, felt happy and vindicated with his votes garnered province-wide since his late father’s massive loss in 2010 elections are still clouded with speculations. On May 17, 2010 his father died from a helicopter crash just a week after the elections. Due to alleged transmission problems of compact flash cards the provincial board of canvassers led by Atty. Urbano Arlando was initially able only to proclaim reelectionist 1st Dist. Cong. Mark Enverga and comebacking former congresswoman Aleta Suarez for the province’ 3rd congressional district whose vote leads are so wide to be affected by the remaining uncanvassed votes. The following day however other winners were proclaimed such as 2nd District Congressman-elect Vicente ‘Kulit’ Alcala and vice governor-elect Sam Nantes. 4th Dist. Congressional bet Dra. Helen Tan who defeated Toby Tañada, brother of 4th Dist. Cong. Erin Tañada III was also proclaimed despite attempts to derail her proclamation. Tan got 84,782 votes against Tañada’s 80,698 while the 3rd bet Alvin John Tañada, the subject of the legal arguments, garnered only 7,038 votes. Despite Toby’s legal counsel vehement objection to the proclamation of Tan, counsel for the latter, former 4th Dist. Board member Sonny Pulgar pressed that the proclamation of his client has public interest which should prevail upon other extraneous matters.